The short-stack roller coaster known as the chipstack belonging to Cy Williams took an uptick when he eliminated Rodney Kahele in 8th place, Kahele cashing for $1,277 and Williams moving to 290,000. 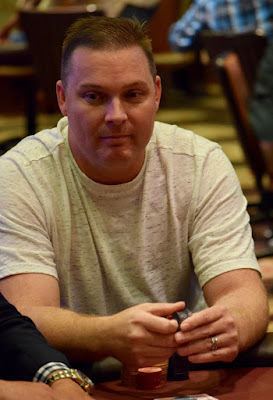 A few hands later it was Eyyal Altar eliminating Shawn Roberts (above) in 7th place, a $1,456 cash. Altar is back up to 500k. Six players remain, there was brief talk of an even chop 8-handed and an ICM chop 8-handed but Altar indicated he was not interested and there's been to ChopTalk since.